Paige Elizabeth Gresty is a writer and filmmaker from Washington, DC by way of London, England. She received her MFA in film directing from UCLA. As an emerging filmmaker, she's written scripts for James Franco and is currently a finalist in several competitions such as the Academy Awards' Nicholl Fellowships. Her writing work has been featured in places such as The Guardian. She lives in Los Angeles with her husband Chris and cat Bey. Jeremy Hight has an MFA in Creative Writing from Cal Arts.. He has published two books of prose (What Remains published by Free Dogma Press and I Am The Ghost Here published by Be About It). He is currently making poems from gifs posted on Facebook and working on a novel about a ghost with an existential crisis. He teaches Creative Writing and English Comp and lives with his soul mate Lisa and his amazing cat Samson. Megan Lent is a writer and filmmaker. You can see her work onvimeo.com/meganlent. Her poetry chapbook I Will Dance When I Am Dead is forthcoming from Hyacinth Girl press. She lives in LA. Rachel Olson is a former urban planner who lives and works in San Francisco. Her previously published works can be found in Be About It Zine #14: The Internet, Be About It online, and Electric Cereal. She enjoys club soda and drives along the coast. Follow her on twitter @rachelsolson. Grant Leuning is a writer and artist in the San Diego / Tijuana border region. He is the co-curator of the long-running San Diego reading series NOW That’s What I Call Poetry, filibustero in El Comité Magonista, and the author of three books of poetry; I Don’t Want to Die in the Ocean, A Million Dollars Isn't Cool, You Know What's Cool, A Billion Dollars and most recently, Piss Cameron, a political grotesque. Miranda Tsang is a writer and educator from San Francisco. She has received scholarships from Community of Writers at Squaw Valley, Bread Loaf Writers' Conference, and Kearny Street Workshop. Her writing is published in Lumen, Public Pool, The Offing, and New Life Quarterly where she is a columnist and reviewer. Yesenia Padilla is a founding editor and editor-in-chief of Lumen Magazine, a literary magazine founded for and by women and non-binary people. 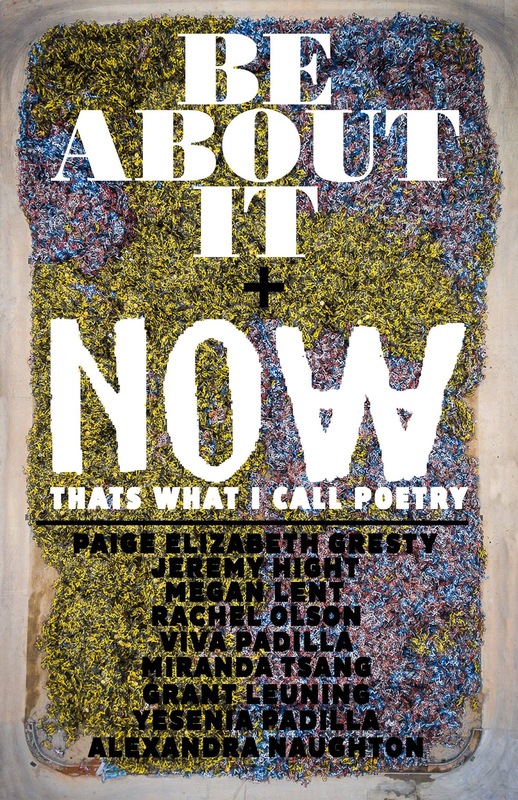 Yesenia also co-curates Now That's What I Call Poetry, a monthly experimental poetry night in Southern California. Her work has been published in Queen Mob's Teahouse, Complex, and as part of the Websafe2k16 project.